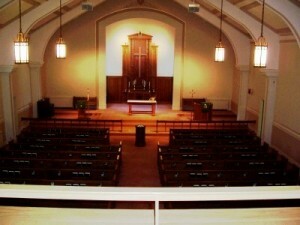 We are pleased that you are interested in having your wedding at Trinity. This page contains information that you will find helpful in planning your service. If we can be of any assistance, please feel free to contact one of the pastors. Wedding Registration Form: The first step in planning your wedding is to send a letter or an email to either one of the pastors. In that note, please specify two separate dates on which you would like to have your wedding. We will then check those dates with our Church calendar and let you know which one works best. A $50 deposit is required if you are not currently on the membership rolls at Trinity. Pre-marital Counseling: It is your responsibility to contact the pastor at least six months before your wedding date to arrange for the wedding planning and counseling sessions. The pastor and the couple will meet at least four times prior to the wedding. Wedding Rehearsal: Unless otherwise indicated, all wedding rehearsals are scheduled for 6:00 p.m. on the Friday before the day of the wedding. It is crucial that all persons involved in the actual ceremony be present for this rehearsal. The rehearsal will last about 40 minutes. Photographs: In keeping with the integrity of the worship service, no flash photography will be allowed during the ceremony. Video equipment is allowed but must remain stationary during the ceremony and is not allowed behind the altar. Auxiliary lighting is also not permitted. Wishing the Couple Well: It has been a tradition to throw rice at the couple as they leave the church. This tradition has proven to be harmful to birds. At Trinity we do not allow the throwing of rice, birdseed, or bread pellets. If you have any questions about what can be thrown after your ceremony to wish the couple well please ask one of the Pastors. Guidelines for photographing weddings can be found by clicking here.